Villa Terrace with 360° view of Lerici - House Unique unconventional. In Location Maralunga, just above the castle of Lerici, you can enjoy a terrace of 60 sqm, sunsets and starry skies that will leave you breathless. A garden, shaded by olive trees and consists of small terraced manicured green lawn surrounding the house. The house is arranged over three floors, tastefully decorated in a nautical style in every detail with a touch of "journeys of Africa" difficult to forget. The house, designed for living all year round, has been completely renovated recently. A sinous arc of land between Piedmont and sea, Liguria is where the Alps and the Appenines cascade precipitously into the Mediterranean. The result is as a striking as it is unique, with ancient settlements clinging precariously to granite cliff a spectacle that reach its apex in Cinque Terre : five quintessential Ligurian fishing villages that dangle like perched medioeval colonies above the foaming oceans. 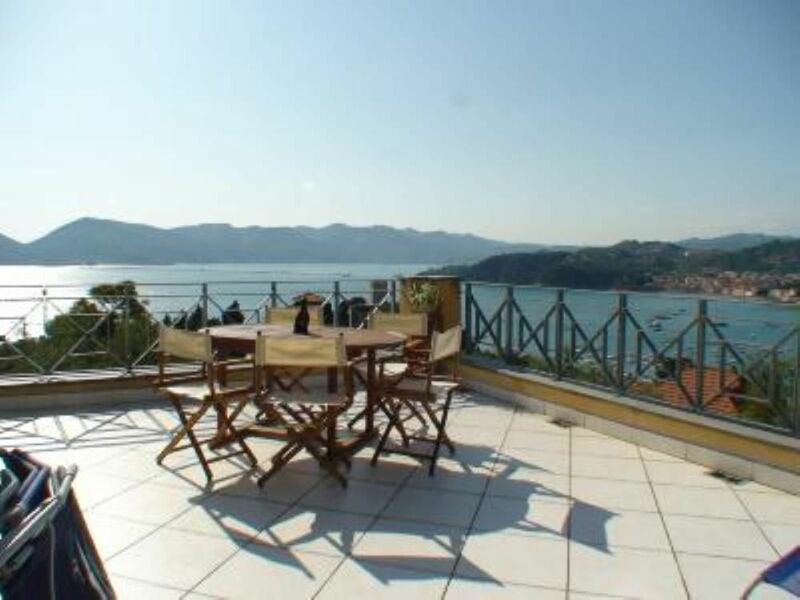 The house is situated on the top of a hill close to Lerici (it takes 10 minutes walking), and it has an amazing sight of the so-called "Poet's Gulf". The surrounding area is really interesting both from the historical and environmental point of view: you can plan many different trips to medieval historical centres like in the surrounding of Sarzana but also roman ruines, like the ancient site of Luni, that are not far from the house. If you like walking in the Nature, not far there is the "Cinque Terre" National Park, or the beautiful Portovenere, that is UNESCO heritage: it takes 30 minute by a small ferryboat from Lerici. You can reach the small city of Lerici and its beaches by steps/stairs in a few minutes (about 10 to the centre of the city, a little more for the beaches), but you can also walk for 2 minutes to the closest bus-stop: there are a lot of other places to go there by bus, like the beaches from the house to Tellaro (to go to these beaches takes about 20/30 minutes walking). Local way of cooking is really good, you can taste good fish and also regional plates ... If you need more information you can write me : I will be happy to answer you right! Super gepflegtes Haus, netter Vermieter. Was will man mehr? Maison très confortable avec vue magnifique. Le seul inconvénient c'est les nombreuses marches pour accéder à la plage ou les commerces. Mais c'est le prix à payer pour avoir une aussi belle vue tout en profitant du calme. Vous pouvez aussi choisir de vous déplacer en voiture mais les places sont peu nombreuses surtout en pleine saison. Wir waren mit 4 Erwachsenen und 2 Kindern (14 Jahre) für zwei Wochen in dem schönen Haus und haben uns sehr wohl gefühlt. Alles war sehr sauber, ordentlich und gut gepflegt. Der Vermieter war offen für Fragen die wir vorher hatten und hat uns gut vorbereitet. Lerici ist ein schöner Ort , aber eigentlich braucht man nur das Haus geniessen mit der Dachterasse und dem unglaublichen Ausblick. Für uns war es zwar eine sehr weite Anreise , aber vielleicht fahren wir wieder mal hin. Lerici ist ein schöner Ort , aber eigentlich braucht man nur das Haus mit der Dachterasse und dem unglaublichen Ausblick geniessen. Für uns war es zwar eine sehr weite Anreise , aber wir werden mal wieder kommen. Wir (2 Erwachsene, 4 Kinder) waren Anfang Juli 2015 in diesem schönen Haus in den Ferien. Das Haus liegt an einer schönen Lage etwas oberhalb des Dorfes. Von der Terrasse sieht man ein traumhaftes Panorama über Meer, die Bucht und die Berge. Durch die erhöhte Lage weht immer eine angenehme Brise das auch hochsommerliche Temperaturen gut zu ertragen sind. Über eine Treppe gelangt man in wenigen Minuten auf den Dorfplatz von Lerci. Das Haus ist geschmackvoll eingerichtet und mit allem was man braucht ausgestattet. Es hat uns an nichts gefehlt. Der Vermieter war sehr freundlich und wir werden bestimmt wieder kommen! Motorway A10 Genova - Livorno: Exit follow to Lerici Sarzana. Magnolia, yew and cedar trees grow in the 1930s public gardens at Lerici, an exclusive retreat of pool-equipped villas clinging to the cliffs along its beach. For outstanding views make you way on foot or by public lift to the 12th century “Castello di Lerici”. Lerici’s tourist office can advise on walking and cycling in the area, as well as accommodation. From the Lerici a scenic 3 km coastal stroll leads north to San Terenzio a seaside village with a sandy beach and Genoese Castle. Another coastal stroll, 4 km south, takes you past magnificent little bays to Tellaro (very cloth to the house), a fisching hamlet with pink-orange houses cluttered about narrow lanes and tiny squares. If you write to me I can give you other useful information on what to do!